Nope, I haven't left yet. And I have some time on my hands this morning as I am sitting at the infusion center receiving my monthly meds. In blogging around today (yes I'm packed) I found this wonderful post at my dear friend Jan's spot Awake is Good. Jan asks: "What are you celebrating about yourself today? What's good, right, and true in your life? "Today I am celebrating being at the infusion center receiving medicine that has slowed down the process of MS in my body! Woohoo! Tomorrow we leave for the seashore...and although I will not be able to walk on the beach (one of my favorite things to do in the whole world-especially early in the morning) I WILL be able to view the the sea and sky from our balcony and sit on the boardwalk by our apartment and enjoy the sounds of the ocean, children laughing, the breeze on my face and body, the joyful energy of being surrounded by my loved ones on our family vacation. So it isn't perfect, it isn't the way it was...but it is the way it is and there is plenty to be grateful for, including my ability to open to the experience with joyful intention." Gratitude is a kind of freedom, isn't it? It allows us to feel nurtured and satisfied in our lives no matter what. Gratitude reminds us to discover the blue skies sometimes hidden by clouds. For my American friends I wish you a happy and safe Forth of July (Independence Day), for everyone else around the world, like Jan, I'd love to hear what you are celebrating in the month of July! 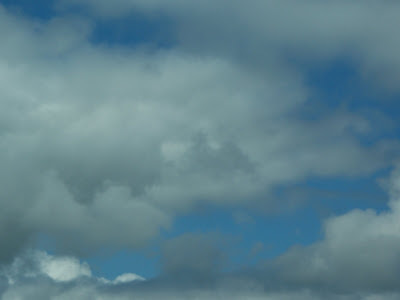 The clouds is beautiful as they give way to the blue sky, and so your post. Thanks for sharing! And happy weekend! Such a good post, especially for Shabbat. Mazal tov on Rosie becoming a bat mitsvah. You have a fine time at the seashore. I hope it will be cooler than at the Dead Sea shore. Shalom Laura, and all the best. This was a beautiful post and lovely photograph. I hope you have a great time at the beach. I'm celebrating summer and fun times in July! Have a great holiday! Laura, have an absolutely beautiful time and I know you'll be drinking in all the fine moments and holding them close. I like your photo with the spot of blue sky. Have a great trip! So important to remember everything worth celebrating, even in bad times. Or should I say, especially in bad times. Celebrating summer holidays, kids and seeing my folks back home in England soon. Beauiutfl sky and post Laura. Happy SWF and 4th of July weekend. So glad that my post jumpstarted a process for you! I appreciate you sharing mine with others. I always love reading your comments because your transparent heart touches mine. I wish you such joy on your vacation. May your time away be love-filled, sacred time spent with family, nature, and your dear self. :-) Hugs! Beautiful post, Laura. I hope your visit to the seashore is a joyous one! Laura, you are a constant inspiration to me. I hope you know that. Have a great vacation, my dear friend! I remember reading your response on Jan's blog and really liking it. Gratitude has truly magical powers. I said what about you????? I think you may have chosen the best week ever to be at the beach. I thought of you sitting in the sun soaking up some rays. Let's hope we get some more summer here in the Northeast after the unsettled weather is through. Wow. You are celebrating yourself, opening wide to the physical limitations, the emotional challenges, and the abundant blessings of family, nature, and gratitude practice. You are a shining example of courage. May I open to my own difficulties and joys the way you have. ( and I don't know why this didn't pop up until now, sorry for the delay in reading) . gratitude is my mantra. the perspective changes everything. SO much do I love reading/hearing of Peeps who are GRATEFUL, even in less than the best of circumstances. And so I am very late in commenting here, but wanted to let you know, Laura...your blog this day is a gem among gems. laura... i've just found you, through Talk at the Table, and i'm so glad i have... i learn from you, already. i'm seeking this gratitude... this peace of self. thank you.